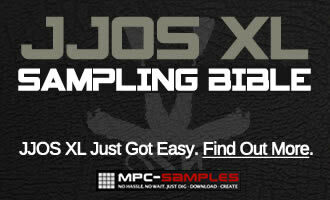 I’m happy to announce the release of my new JJOSXL tutorial book, the ‘JJOSXL Sampling Bible‘. This is the first and only tutorial book written for JJOSXL, with 125 pages of JJOSXL tutorials specifically about the creative uses of sampling in JJOSXL with plenty of practical, step-by-step beat making and song creation projects for you to recreate in your MPC as you read along. Every aspect of JJOSXL sampling is comprehensively covered using a variety of drum breaks, instrument loops, complete songs and even classical pieces, to quickly teach the skills required to make your own music using JJOSXL. The book is fully compatible with any MPC1000 running JJOS2XL 3.2x and any MPC2500 running JJOS-XL 3.2x (3.26 was the version at the time of publication) and is available as an instant digital download – for more information, check out the JJOSXL Sampling Bible at MPC-Samples.com. Where are all the “beat making for the mpc 4000” tutorials? Can I use the sampling bible with the 4k? The JJOSXL Sampling Bible is only suitable for JJOSXL. I hope to make some tutorials for the 4000 in the future! Thanks Mike, I appreciate the feedback!